Kim Hyun-hee, the last surviving bomber of Korean Air flight 858, has appeared for the first time on a TV talk show to tell her side of the story. In the two-part talk show on TV Chosun broadcast on Monday and Tuesday, Kim said former North Korean leader Kim Jong-il personally ordered the 1987 bombing of the flight in order to disrupt the 1988 Summer Olympics in Seoul and foment fear in the South. At the time she felt no pang of conscience but was overwhelmed that she had been chosen by the "dear leader" to carry out a huge mission, she recalled. Kim described in detail how she was selected as an agent. When she was studying Japanese at Pyongyang University of Foreign Studies, officials from the Workers Party interviewed and tested students. They went through memory, observation and physical exams and had to prove their loyalty to the party. During her seven years and eight months of spy training, she learned Chinese and Japanese and had to undergo endurance training like climbing mountains with 10 kg weights tied to her legs, as well as being taught self-defense skills, shooting, swimming, radio communication and code breaking. She said KAL 858 was targeted because the passengers were mainly South Koreans workers going to the Middle East and there were few foreigners whose death could trigger diplomatic problems. When Kim was captured, she was ordered by fellow agent Kim Seung-il, who was posing as her father, to commit suicide by poison pill. But local police tried to wrest a cigarette pack containing the pill away from her, forcing her to rush and bungle the attempt. Kim was brought to South Korea and confessed eight days later. She said she had a change of heart because South Korean intelligence officers took her sightseeing and she saw how freely and comfortably people in the South lived. She married a National Intelligence Service agent in 1997 and has two children. 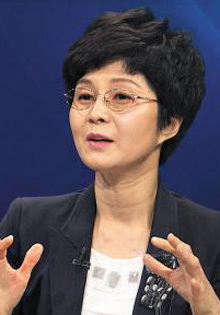 She said she was dismayed when even NIS officials during the Roh Moo-hyun administration accused her of being part of an elaborate setup designed to blacken North Korea's name. "The Roh government told me to emigrate," Kim said. "They were probably trying to make it look as if I'd fled because I was a fake." Kim also talked about the meaning of her survival. She said people in the South do not know how valuable freedom is. "That is why we are seeing pro-North figures in the South who worship North Korea," she said. The reason she was pardoned by South Korea is because the country wanted her to serve as a living reminder of the brutality of the North Korean regime, she added.